Now available as a Free Download - please see details at the bottom of the page. Here are my best 50 Fish and Seafood Soup Recipes in a convenient eBook for you to have as a valuable addition to your collection. Here is the full Table of Contents. These are all outstanding quality recipes - all different using various techniques and mixtures of ingredients. Soups from around the World that will tempt you to give them a try. I wrote the book in response to requests for more soup recipes. 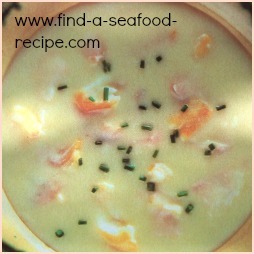 Fish soups are quick to prepare and cook - no lengthy simmering of stock here! As you can see from the list, there are a few recipes already on my site but many more that I don't have room for. * How to prepare fish and shellfish. * How to cook lobster and crab. * How you can use the shells and trimmings for another meal. * How to prepare mussels. * How to open scallops. * How to make croutons, my quick method for herb or garlic bread and other original ideas to make your soup into a superb taste experience. * There's tips for selecting the right vegetables and how to get rid of fish odours left by cooking. All the answers to the questions I often get asked by my readers. It's priced at $10 (that's just 20 cents a recipe and all the other info is a bonus) and of course there's no shipping, because it's instant download -which means you get it now to start cooking straight away. If you're not entirely satisfied, then I will refund your money - no questions asked and you get to keep the book anyway. If you want the free 5 part eCourse, then please complete the form at the bottom of this page. $10 to pay for 50 Fish and Seafood Soup Recipes. This Buy Now button will take you to Paypal - you don't need a Paypal account to use Paypal as there are options to pay by card. From there, you will be directed to Payloadz where you will be able to download the 50 Fish and Seafood Recipe Book in pdf format. If you don't have Acrobat, then you will be prompted to download it - it's free and safe to do so. I hope you enjoy the book - if you have any comments I would be pleased to hear from you. If you are not entirely satisfied, then I will refund your money - no questions asked - just send me an email - so there is no risk to you at all in purchasing. You will get an excellent range of fish and seafood recipes - some you will have heard of, some you won't and it could set you off on the road of experimenting for yourself. I have thoroughly enjoyed researching and writing this recipe book - there will be more to follow and I welcome any suggestions or special requests you have. The book is available as a 5 part eCourse as well. If you complete the form below, you will recieve the course in 5 parts at one day intervals. Please complete the form to recieve the first installment.